One of the best practices for Drupal 8 that is still emerging is how to create modules with complex deployable configuration. In the past we often abused the features module to do this, and while that continues to be an option, with Drupal 8’s vastly improved configuration management options and the ability to install configuration easily I have been looking for something better. I particularly want to build modules that don’t have unnecessary dependencies but I can still reliably include all the needed configuration in my project. And after a few tries I think I’ve struck on an effective process. Let’s start with a quick refresher on installing configuration for a Drupal 8 module. During module installation Drupal will load any yaml files that match configuration patterns it already knows about that are included in your module’s config/install directory. In theory this is great but if you want to include configuration that comes with other modules you have to figure out what files are needed; if you want to include configuration from core modules you probably will need to find a fairly large collection files to get all the required elements. Finding all those files, and copying them quickly and easily is the challenge I set out to solve. Now I create my module and a second repository just for it. The module’s repository is linked to a remote since this is the actual product I’m creating. With that plumbing in place I can to make whatever configuration change I need included in the module. Lately I’ve been creating a custom moderation workflow with several user roles and edge cases that will need to be deployed on a dozen or so sites, so you’ll see that reflected below, but this process should work for just about any project with lots of interrelated configuration. Notice that I skip the core.extensions.yml file. If your module had dependencies you’ll still need to update your module’s info.yml file to list them. 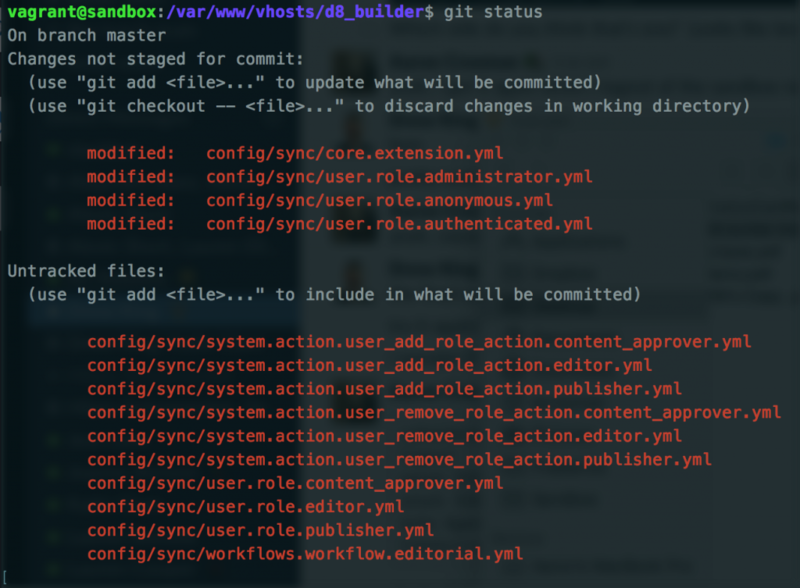 Now a quick commit and push of the changes to the module’s repo, and I’m ready to pull the module into other projects. I also commit the builder repo to ensure it’s easy to track any future changes. This isn’t a replacement for tools like Configuration Installer, which are designed to handle an entire site, this is intended just for module development. If you think you have a better solution, or that I’m missing something important please let me know. Yeah we do similar, though we haven’t used any tools to actually move the exported configuration to the module; but instead just do it manually. That looks neat though. One thing we do in addition is that we add a enforced dependency on each configuration to the module because if we don’t, if we uninstall the module and later tries to install it again it fails because the configuration from the module would still be active. –remove-config-hash will save you a step. Thanks I had missed those. I’ve edited the post to include that.